Our half marathon training is going really well... at least I think it is as I really have nothing to compare to it! I have been running just to run for so many years, with no set distances or goals, and so having a training schedule seems a little odd to me. We are now in week # 6 and have been following the schedule pretty much as written. There have been a couple of hiccups but no set backs. On Monday this week we did our usual 3 miles and when I went to log it, I realized we are supposed to be doing a fall back week, and should only have run 2 miles. Oops! And today, we were scheduled to do 2 miles again so I used classic.mapmyrun.com to find us a route in the neighborhood and off we went. It was a pretty speedy little loop and we did it in 21.5 minutes without a walk break.... that is pretty fast for me, of late, and I was very pleased. I am still logging miles for the Winter 100 Challenge sponsored by Kristen, who blogs at The Running Mom. I just checked our training schedule and I am supposed to run 35 more miles before the end of February so it looks like I will make it! Are you participating in the Winter 100 Challenge? On Saturday we will be dedicating our 4 mile training run to Sherry Arnold. I hope you will be able to participate in this virtual run, too. Are you going to be able to take part in Saturday's run? Ooh I had almost forgotten about that challenge! I knew there was one more winter challenge that was still going on. I'm at 83 so I should hit 100 before the weekend is over! Way to go keeping up the mileage! :) I'm in it too. yay!!! saturday is my first day back to running and i am so honored to be able to dedicate that run to Sherry's memory! you are so inspiring with your running dedication Elle! i am so happy that it is going so well for you! I am doing the run this weekend, just by myself. There are several organized ones but I don't want to drive half an hour to get there. Glad to hear all your training is going so good! Good luck with the rest of training. I have a 3-mile training run on Saturday, so I won't be doing the full 4 miles. 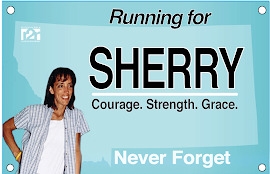 We're running 7 this Saturday, and I will be running to remember Sherry. It breaks my heart to know what happened to her. Especially for her family and the people who knew her personally. So incredibly sad. Glad to hear your training is going well!